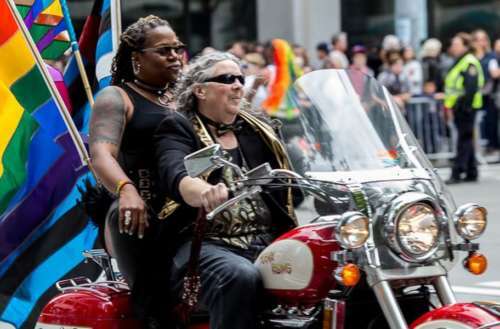 It wouldn’t be Pride without them: every June, women on motorcycles draw cheers from onlookers in Pride parades around the country, harkening back to the early days of modern queer liberation. Dykes on Bikes have been a force to be reckoned with since 1976 — but they’ve had a bumpy road over the last 40 years. Nobody’s quite sure where the term “Dykes on Bikes” originated. It was definitely present at their first San Francisco Pride event in 1976, but it probably goes back even further. ‘Lesbians on motorcycles’ has long been a popular trope of pulp novels, and it wasn’t unusual for women to learn to ride motorcycles in the Army during World War II. Throughout the early 1940s, women were called upon to engage in occupations normally prohibited to them on the basis of gender, and many remained active in motorcycle groups long after the war ended. 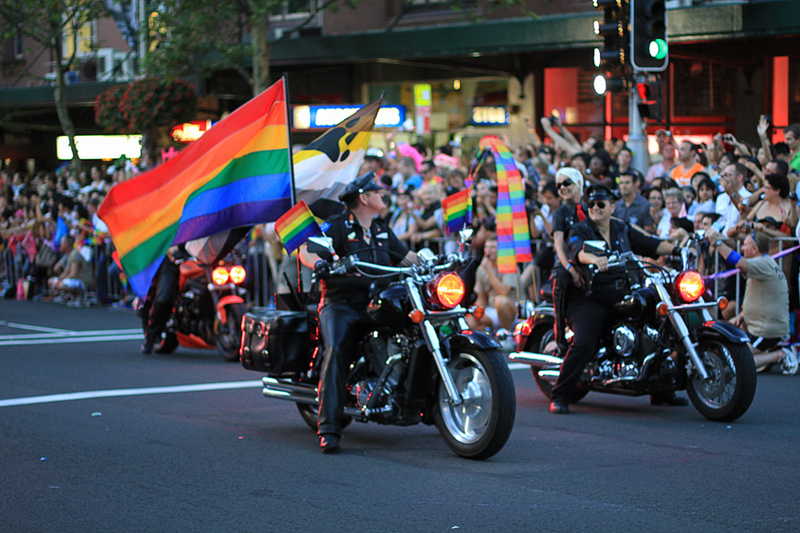 The Dykes on Bikes made their Pride debut with a group of 20 to 25 women. They never expected it to become an annual tradition or a global phenomenon, and in fact there was no formal structure for the first few years. They’d simply show up to the parade, ride and then disperse. It’s a long way from the 400 or so that appear in some parades today. 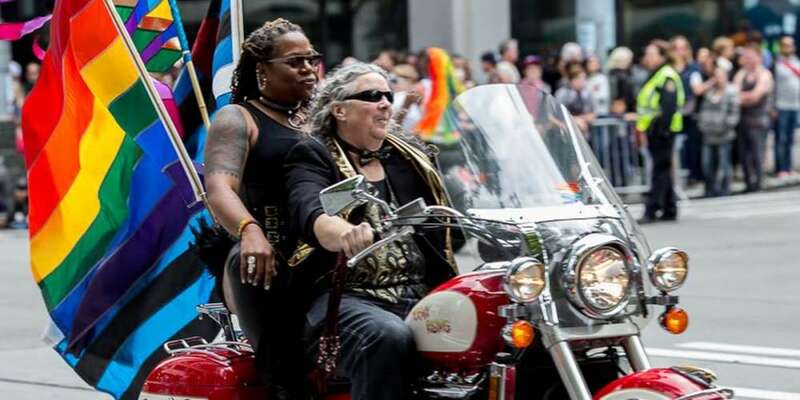 Their appearance at the start of San Francisco’s Pride parade was, from the start, a matter of pragmatism: The motorcycles could ride at a reliable speed, which meant they could set the pace for the rest of the parade. Though they’re known informally as Dykes on Bikes, the organization is technically known as the Women’s Motorcycle Contingent. Nevertheless, the WMC has safeguarded the “Dykes on Bikes” name, going so far as to trademark it to ensure that it isn’t abused. That trademark nearly didn’t happen. After they filed the application in the early 2000s, the Trademark Office responded that the term “Dykes” was disparaging. That led to a two-year court battle during which the WMC had to prove they weren’t using the term to denigrate anyone. Eventually the office relented, recognizing that the term, while potentially offensive, had been reclaimed in this context by the very group it was initially thought to disparage. There was also a separate challenge from a lawyer who claimed the term was disparaging to men, since (he said) the purpose of the organization was to express hatred of men. His claim was easily rejected by the court. Today Dykes on Bikes boast over 20 international chapters, all overseen from the main office in San Francisco where it all began. They’ve faced criticism from within the community over the years — most notably by those who say the image of women engaging in stereotypically masculine activities is alienating to mainstream culture. But the group provides much-needed role models for individuals from whom the mainstream holds little appeal, and they remind onlookers of the rebellion that sparked the modern queer liberation movement in the first place. Were you aware of the history of Dykes on Bikes? Sound off in the comments.